Gossypianthus lanuginosus (Poir. ) Moq. Stems: Much-branched, 4 to 28 inches long, pilose to villous or lanate. Leaves: Basal and cauline, opposite; basal with petiole 1/5 to 4/5 inch, blade linear to linear-oblanceolate or spatulate, 3/5 to 4 inches long, 1/12 to 3/5 inch wide, base tapered, margins entire, tip acute, without spine-like bristle at tip; cauline with petiole 1/25 to 1/5 inch, blade ovate to elliptic or oblong, 1/5 to 1 inch long, 1/25 to 3/5 inch wide, base cordate to truncate, margins entire, tip acute, without spine-like bristle at tip, surfaces glabrous or sparsely to densely pilose or strigose. Inflorescences: Axillary glomerules, 6-12-flowered; bracts 2, membranous, without spine-like bristle at tip. 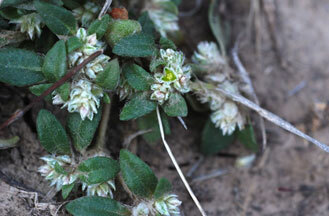 Flowers: Bisexual; tepals 5, distinct, green, oblong-lanceolate, 1/10 to 1/6 inch, apex acuminate, woolly; stamens 5, fused basally; style 1; stigmas 2-lobed. Fruits: Utricles, ovoid, 1/18 to 1/12 inch; seeds brown, lenticular-orbicular. Comments: Gossypianthus, cotton and flower, alluding to the villous tepals and lanuginosus, woolly. Kansas plants are var. lanuginosus.